How much to tip movers? - Do You Need to Tip Your Long Distance Movers? Do You Need to Tip Your Long Distance Movers? According to an Angie’s List member survey, the “Movers” category was cited by the highest number of survey respondents as the category in which they were most likely to leave a tip. Reading that made everyone here at Garrett’s feel really thankful for being so appreciated by our amazing customers! However, this site did note that many of the major moving companies they spoke to said tipping is not expected, and that it is up to the customer. Also, some moving companies already figure in a tip with long distance moving estimates. We would advise calling your movers beforehand to see what they suggest on how much to tip movers. If you do decide to tip, be sure and check if you will have one crew packing and loading your things, and another one that actually drives your belongings long distance. If so, you’ll know whether you need to tip your first crew after they pack the truck or if it can wait until the shipment is delivered. What About Tipping by Percentage? Although a lot of sites out there recommend tipping as a percentage of the total cost of the move, we don’t recommend that, especially if the move is long distance. Here’s why. The cost of a move includes many different things. It not only includes labor, but the cost of fuel as well. 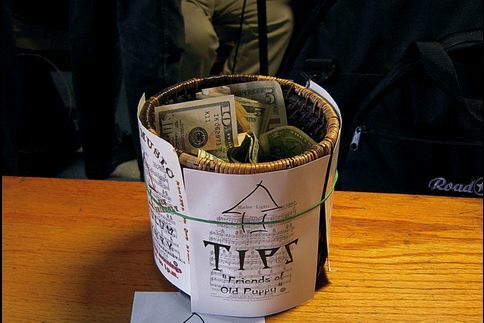 A tip could become very costly if it is done by percentage. If you’ve ever been a part of a move, you know that it’s hard work (that’s probably why you hired a mover in the first place!). And all that hard work is sure to make your make your moving crew hungry and thirsty. So imagine their delight when you surprise them with a cooler full of snacks and drinks. They’ll really appreciate the fuel for the long road ahead. If you are really happy with the way they loaded your things, consider even buying them lunch and/or dinner. If you are looking for long distance movers, give Garrett’s Moving & Storage a call at 972-487-5843 for a free quote. We’ve done thousands of long distance moves from New York to Los Angeles and everywhere in between. Or if you would rather get a quote online, click here to fill out our estimate form, and we’ll be in contact with you within the next business day.